Microsoft released the Office 365 Planner App for Office 365 Enterprise subscriptions last year. Planner is a lightweight program to address project task management and teamwork. As part of Microsoft Office 365, Microsoft offers its Enterprise users a product called Microsoft Project Online. Our users may ask, why 2 products? What’s the difference? Which one should I use? Should I use both? Let me try to give some answers. So it’s Microsoft Planner VS Microsoft Project Online. Planner is much simpler than Project Online; it is positioned somewhere between Office task list and Project Online in terms of ease of use, features, and overall user experience. If you are have not been informed about what Planner is, you may refer to our previous blog posts HERE and HERE or go to the Planner product page for a product overview. Looking for Microsoft Planner and Project Online Integration? 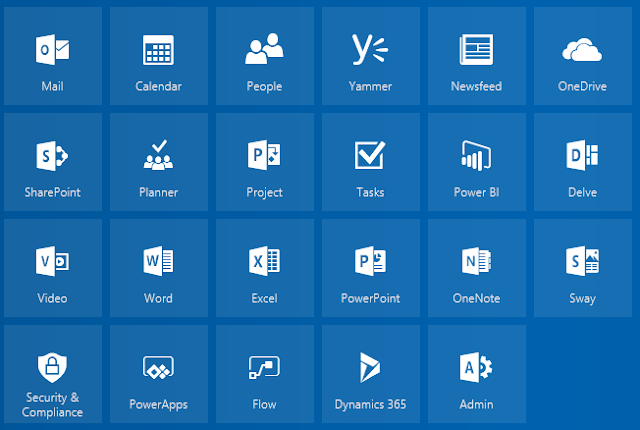 If you are a part of an organization with an Office 365 Enterprise subscription, then you will see the Planner icon in the Office 365 application list, as shown below (if not, please ask your Office 365 Administrator to assign you a license – it is free). Planner and Project Online are two distinct products, but they both address project collaboration and teamwork. They are not integrated (at least, out of the box) but can be integrated with 3rd-party solutions. Planner is very easy to adopt and use, but it comes with no customization capabilities. Project Online is best suited for an enterprise’s project and portfolio management, as it is equipped with advanced customization capabilities. To compare the two systems, please use the tables below to see their commonalities and differences. We have also put together a features matrix which is used as a summary at the end. As you can see, Project Online was designed for an advanced and formal project management approach, can support different kinds of businesses and is highly customizable. However, this flexibility and great value for executives and PMOs comes with the price of complexity for team members, and that’s why Project Online is considered to be too complex for some organizations. Such organizations can benefit from using Office 365 Planner. Planner can be used by organizations who have just started implementing project management practices. This is a great platform to start with, and it is completely free for Office 365 users, versus products from competitors, such as Trello, Basecamp or Asana. But on wider scale, I personally see Planner used not as an alternative to Project Online but as a daily instrument for team members. With the help of integration (and this can be obtained with a product from FluentPro, Integration Hub, which connects Planner and Project Online), team members can work on tasks in Planner, and all progress will flow to Project Online so Management will have a reliable “big picture” and full visibility of all projects in the organization. I hope we’ve answered you questions on Microsoft Planner VS Microsoft Project Online. Interested in advanced reporting on Planner Data with Microsoft Power BI?